How did the snake get its slither? Ever since the crafty serpent in Genesis tempted Eve into eating the forbidden fruit, we’ve been fascinated by snakes. And, despite our interest in this animal, we have a poor understanding of how it actually evolved. But scientists have now released a new study on the fossil of a snake that appears to have lived between 100m and 146m years ago. And what’s more it had legs. The reasons we know so little about snake evolution is because there are so few fossils. 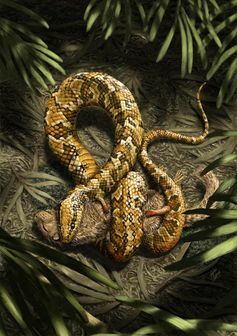 Molecular data suggests that snakes appeared within the squamate family tree – including lizards and amphibians without limbs – sometime in the Jurassic (more than 150m years ago). However, the oldest known undisputed fossil snakes are much younger, from the Cretaceous (about 110m years ago). 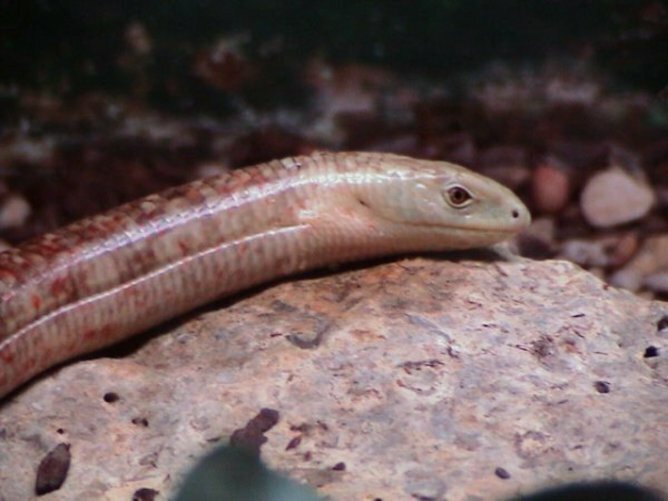 While snakes are thought to be a single evolutionary group, sharing a common ancestor, the evolution of limblessness is actually quite a common feature of squamate evolution. The loss of limbs, correlated with body elongation, has occurred during the evolution of more than 20 members of this group of vertebrates. An example are the flap-footed lizards called Pygopodidae, which look very similar to snakes. Perhaps there is a biomechanical reason for this kind of evolution? If the body evolves to get longer and longer, it may be physically harder to effectively use legs and arms. In the case of snakes, some fossils are known that document one part of this transition, showing that, earlier in their evolution, some snakes had hindlimbs. This has also led to suggestions that these squamates evolved from animals in the oceans. But the new fossil, Tetrapodophis, from Brazil, has four intact limbs and a super-elongate body – similar to modern snakes. Interestingly it also has many more vertebrae than is normal for any snake known so far, living or fossil. Well preserved specimen. Dave Martill, University of Portsmouth. This fossil suggests that this body structure would work for burrowing rather than swimming. That’s one reason why it is so important – it implies that snakes evolved on land rather than in the sea. 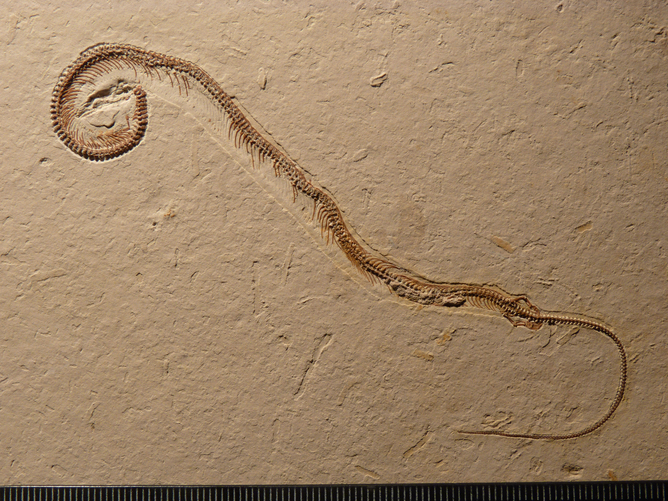 Aside from being critical to new understanding of the early evolution of snakes, this fossil is also interesting in a wider palaeontological context. As I have argued previously argued, fossil collecting is a field in which anyone can, and should, be encouraged to participate. Fossils housed in all kinds of collections should form the basis of our scientific work. Many people, including some professional societies, argue that only fossils curated and reposited in recognised public institutions (such as museums and universities) should be worked on and appear in scientific journals. According to this paper, the snake fossil specimen is part of a private collection, where it was housed for many decades before its importance was realised. The owner has now placed it in the long-term care of the Bürgermeister-Müller-Museum in Germany. However, many of us working in the field are hoping that it will be returned to Brazil in the near future. Article by Gareth Dyke, Palaeontologist at University of Southampton. This article was originally published on The Conversation. Read the original article. 07/26/2015. Category: animals. Tags: snakes.